The bumping and bouncing beat of rap music filled Nordy’s Place Saturday evening as students snapped and clapped along to live music and slam poetry. G Yamazawa rapidly spit lyrics rooted in personal stories about race and culture. “When you forget where you’re from, you truly become American,” he said. Invited by Pitt’s Asian Student Alliance, the Asian-American slam poet and rapper George Yamazawa performed for about 70 students in Nordy’s Place in the William Pitt Union. His work is known for challenging American perspectives of race and culture, commenting on stereotypes and conveying his struggle being an Asian American. Yamazawa has performed at more than 200 universities, the Pentagon and the Sundance Film Festival. He was crowned the National Poetry Slam Champion in 2014 and co-founded Sacrificial Poets — a poetry organization that advocates for youth empowerment through poetry. The opening poem of the night was “10 Things You Should Know About Being an Asian From the South.” This particular poem was a humorous response to dealing with racism and being picked on as an Asian American growing up in Durham, North Carolina. “Dog I’m Asian, I eat cats like you,” he said. Christine Nguyen, a junior computer engineering student, attended the event for Yamazawa’s lively performance and the chance to hear about the performer’s opinions on issues in the Asian community such as “anti-blackness.” Although she has followed Yamazawa on YouTube for a couple of years, this was her first time seeing him live. She was inspired by how his words focus on challenging stereotypes and misconceptions about race and tries to incorporate his techniques into her own writing. “I think G coming to Pitt — you know we don’t have a lot of conversations about resolving a lot of the issues of racism in the Asian-American community — is a huge part in taking a step towards understanding other people and solving those issues of racism,” Nguyen said. 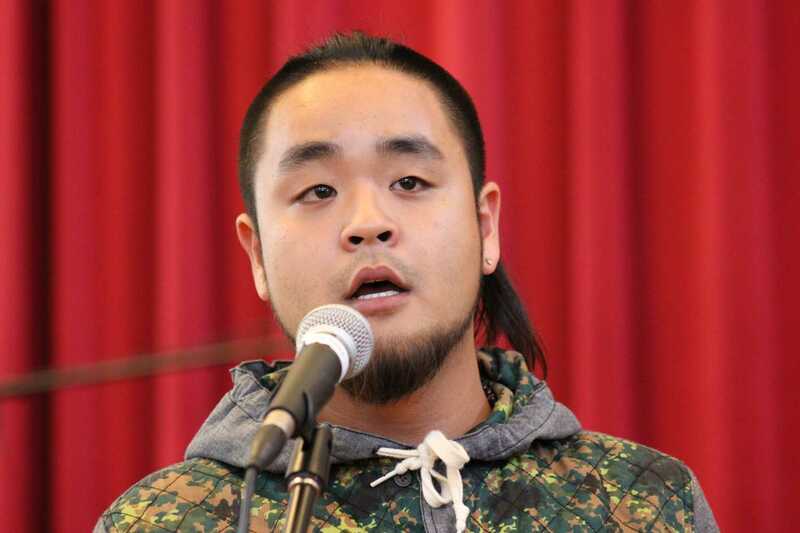 Yamazawa recited several more of his poems, with most focusing on cultural identity and relating to his life and family. One poem, “The Bridge,” referenced his father’s struggle to make a living in a country where he was not a native English speaker. “Speaking English is like climbing a barbed wire fence / Standard English wasn’t gonna feed his children,” he said. Along with sharing a lot of personal stories, Yamazawa’s poems focused on the guilt and confusion he felt being born in America yet tied to his Japanese roots. In one of his poems, he spoke about how the culture he grew up in distanced him from his heritage. “The doctor tricked me into thinking English was my native language,” he said. Devin Dang, a junior computer science major, was influenced and touched by Yamazawa’s mentions of the culture clash that happens between generations of Asian-American families. His performance brought out Dang’s feelings of guilt about the language barriers within his own family. Several other students connected with Yamazawa’s words on family. Some even felt he reminded them of family. Katherine Pham, a first-year neuroscience major, said the poems made her miss home and she felt like she could relate to Yamazawa like a brother because of his humor and energy. Yamazawa also shared some of his raps with the audience, which followed the same themes of cultural identity and family history as the poems. They also focused on his hometown of Durham. In his piece “North Cack,” he showed his pride for Durham by rapping about southern culture — mainly focusing on a specific southern food. “Bull City born bred, cornbread fed / I’m Bull City cornbread, cornbread cornbread cornbread,” he rapped. The event ended with a question-and-answer segment led by ASA advocacy chair Albert Tanjaya. Yamazawa shared his inspirations and most meaningful concepts he has learned as an artist. He focused on the unwavering support his parents gave him when he decided to become an artist, despite having different plans for him. Yamazawa told the audience to focus on the importance of basing your work on your life and experiences. He said to be aware of how your work makes other feel and to be sincere about who you are. “It’s not about what you have to say in your poem, it’s about what you have to say when your poem is done,” he said.